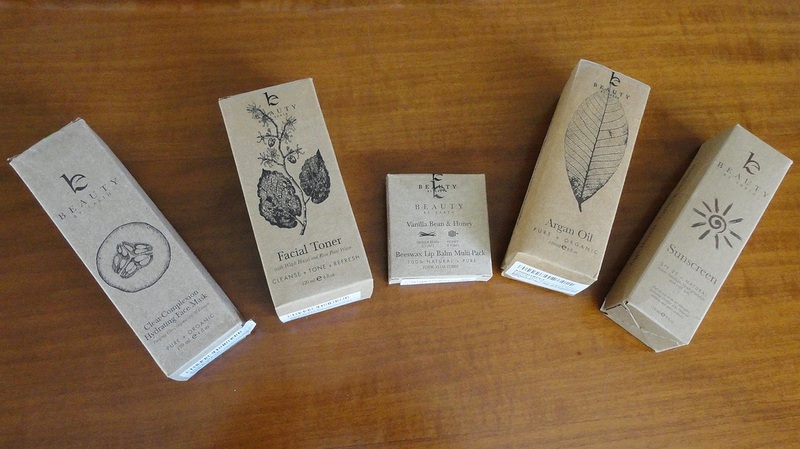 Beauty by Earth is a new entry in the fast-growing sector of natural skin care, and I was happy to receive a substantially discounted selection of their products for evaluation. I'm not quite sure why it has taken so many years for women to realize that noxious chemicals have no place in skin care and, indeed, make-up. In any case, I welcome the "natural" revolution, a long-overdue return to skin care made from plant extracts and essential oils, rendered more effective by the judicious addition of powerful anti-ageing compounds that aim to preserve the skin's youthful attributes of elasticity, moisture retention and collagen content. 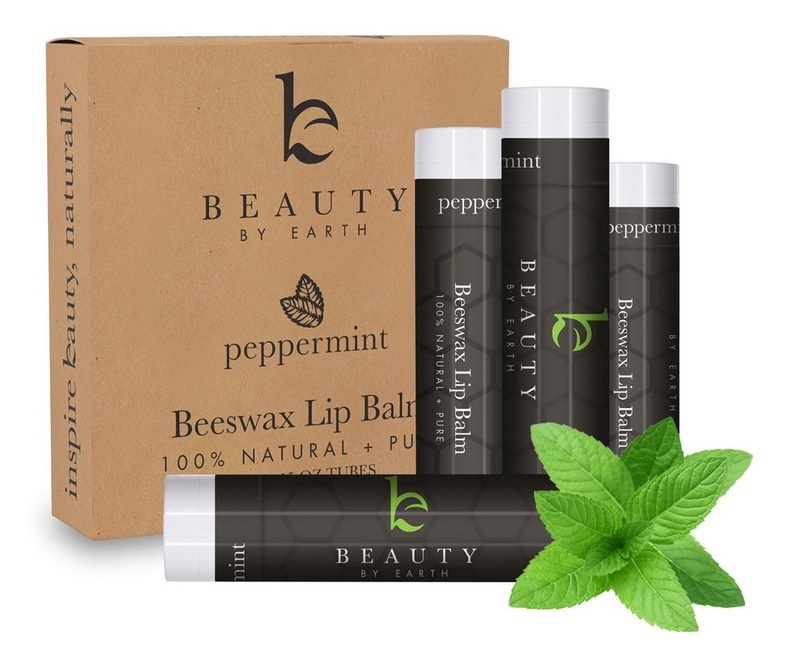 These are wonderful products based on pure and organic ingredients, and free of parabens, GMO, gluten, soy, artificial additives and fragrances. Also of great importance to me, they are not tested on animals and, on a purely aesthetic level, I love the gorgeous, organic packaging. It's made from recycled materials and is biodegradable, but I have kept the boxes because I love the parchment look and the elegant line drawings reminiscent of Medieval Herbals. Well this mask was a total surprise. 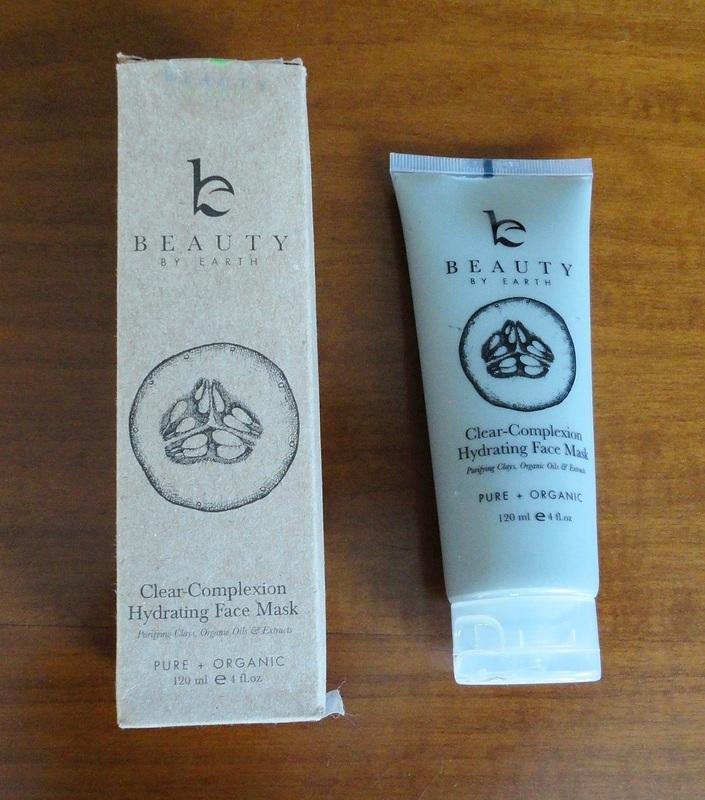 Received for evaluation and review, I expected something specifically for acne and oily skin. It certainly has a visible clearing effect on my face but what totally blew me away is the hydrating and nourishing action. It's one of the easiest to use masks I've ever tried and I love using it. The texture is thickly creamy, it's a dream to spread, it sticks exactly where you put it, does not clump or fall off. It works best if you open the pores first by applying a warm, moist towel. You don't need a lot to cover your face, in fact it would be a waste to pile it on too thickly. After 15-20 minutes, when the mask is visibly dry, it's equally easy to remove with warm water and a beauty sponge, ideally in the shower but not necessarily. The recipe is an inspired mix of natural but powerful ingredients: Kaoline and Bentonite Clays (to draw out impurities and re-mineralize tired skin), Algae extracts (to detoxify and feed), Cucumber extract (soothing and hydrating), Calendula extract and Aloe Vera (healing and skin repair agents), Caprylic and Lauric Acids (to replenish moisture and fight inflammation and infection). So use it to help your acne, if you wish, but I'm using it to rejuvenate and refresh my fragile, mature skin. No sensitivity or drying out, my skin emerges fresh and smooth. The aroma is clean and delicious, perfectly suitable for male faces who can benefit greatly from this supremely cleansing treatment. The presentation is earthy and appealing, 120 ml in a good-size tube of soft plastic, perfect for squeezing the small amount needed (about the size of a large grape). This is one of the test products that I will buy again once my sample is finished. This product was proposed to me for an objective evaluation, and it has turned out to be the only sunscreen I actually don't mind using. My previous purchases left me less than enthusiastic. Either the small or texture put me off, or the product didn't seem to do much either than give me a ghostly sheen. Also I was concerned about the chemicals listed on the tube. As I'm still struggling to minimize some very visible and stubborn discolouration on my cheeks and forehead, I have finally accepted that too much sun can have a permanent and unflattering effect on my skin. I love being tanned, so it's great to have found a product I can depend on to protect my face from the damage of excessive sun exposure. 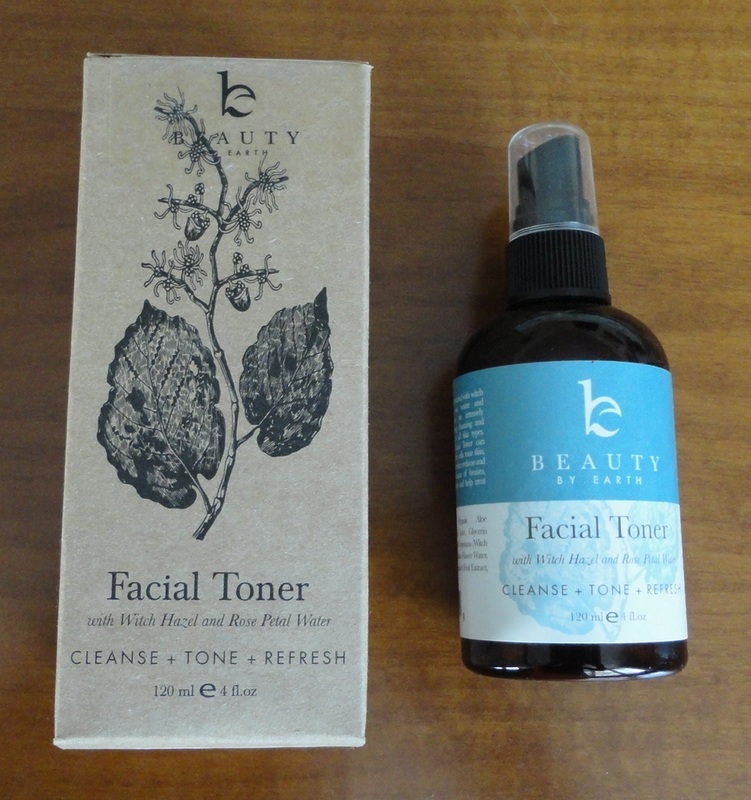 This delightful toner adopts the time-honoured recipe of Witch Hazel and Rose Water, classic astringent and cleansing ingredients used by women for centuries to refresh their complexions, tighten pores and tone the skin. I am crazy about rose-based skin care and find the scent captivating. Also present are Aloe Vera and Cucumber extract, adding decongestant and healing properties. Thankfully missing is alcohol, which my skin would react to with redness and dryness. The dark plastic bottle holds 120 ml, enough for a couple of months, unless you bathe in it. 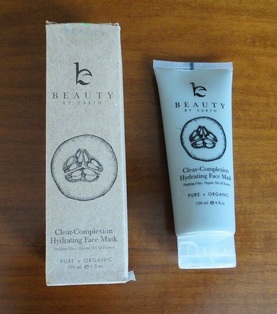 A larger bottle is also available, with double the contents. It has a pump dispenser so you can spritz this deliciously-scented liquid all over your face and neck for a quick freshen-up, or soak a cotton pad for make-up removal and deep cleansing. I was surprised to see that I can spray this over my made-up face without causing a melt-down. After regular daily use for the last month, I am delighted with its skin clearing and hydrating properties. The weather has been challenging: very hot and sweaty, followed by a week of much cooler temperatures and even a few summer thunder showers. Usually that spells disaster, with my tanned and dry skin suddenly breaking out when deprived of sun. Not this time though, and I attribute the welcome change to using this lovely product. The natural ingredients make it perfect for mature, sensitive skin like mine but I could see men and teens using it, too, especially if dealing with acne or allergy-prone skin. Argan oil has been a beauty staple for eons, and it's currently enjoying a well-deserved revival as a wonder treatment for both hair and skin. It seems to be everywhere but I have found that products containing or based on Argan Oil can be extremely different in both quality and effectiveness. This particular one is pure, 100% cold-pressed Argan Oil (as with other oils, cold pressing produces the best quality) and just about the lightest version I have tried so far. I bought it at a significant discount for independent testing and review and, as is my habit, I discontinued all other similar products and for a month I have focused on this one uniquely. 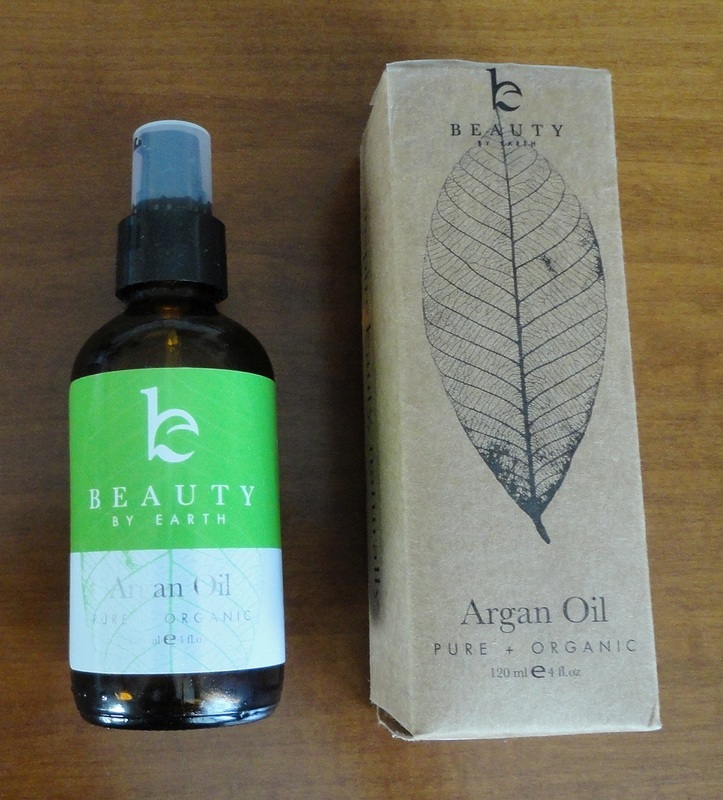 Argan Oil can be used on the body and even on the face, but it is a classic hair nourishing treatment. My hair can use all the help it can get. Age has certainly affected the shine and elasticity, but not the volume, so when too much sun or chlorine dry the life out of it, I'm left with a mass of very brittle, frizzy hair that looks fried and unruly. Although I use excellent shampoos and conditioners, I found that adding a few drops of this Argan Oil after my shower to damp (or even dry) hair makes a huge difference. Also, since I avoid daily shampoos, my hair seems to be able to absorb repeated applications without getting heavy or greasy. I do like the subtle shine I see and the immediate smoothing action. Once a week I use it as a a hair mask treatment (meaning that I apply a scant teaspoonful to my shoulder-length hair until it feels fairly oily and heavy). I then wrap my head in a hot towel and leave the oil on for a few hours before shampooing and conditioning as usual. The results are very good and, after a few treatments, my hair is already softer and, dare I say it, more flowing. I also like to use this oil on my legs as a softener for dry skin; it penetrates quickly and leaves behind a pretty sheen. And it's wonderful as a carrier oil; you can add a few drops of your favourite essential oils and the resulting mix will allow a little time for massaging before being absorbed. I have also tried it on my face but my skin is mixed and it works best for me as a night-time moisturizer. A very small amount gives my face a welcome softness without clogging my pores. Another good application is as a localized treatment for hands and nails, massaged into the cuticles at night-time. If you use Argan Oil and are ready to buy the next bottle, you might want to try this lovely oil. After many years of reckless sun tanning and more burns than he can remember, last year my husband went to see a dermatologist about some skin pigmentation and raised bits that looked concerning. The doctor treated a number of the anomalies with liquid nitrogen, gave him a couple of prescriptions for ongoing care and advised more caution when sunbathing. So, for the first time ever, we went looking for physical sunscreens and more serious protection than our usual tropical suntanning oils. We bought a couple of sunblocks and, when I was offered a substantial discount on this product with an invitation to evaluate and review it, I felt qualified enough to accept. 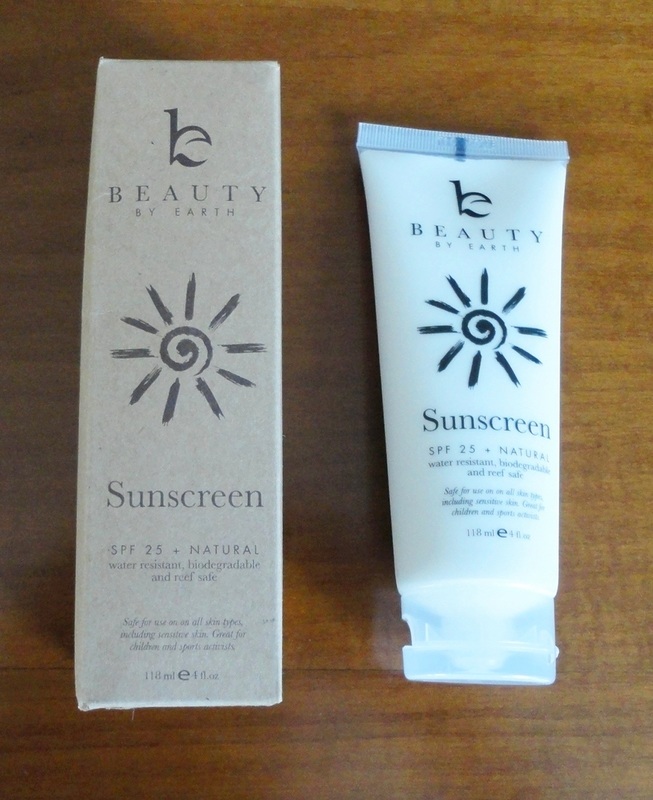 So, after a suitable testing period, my personal view is that this sunscreen is a very capable product that addresses the needs of fair and delicate skin seeking protection from the harmful effects of the sun's UV rays. Ideal for children and those who burn easily. and essential for people who work outdoors in situations where prolonged sun exposure is unavoidable. As for me, while I understand the dangers and embrace the idea in principle, I am not overly keen on the white cast (titanium dioxide is the pigment that makes house paint and oil colours blindingly white). This is a common problem with sun blocks but, at least with this cream, you can tone it down to a minimum if you use a small amount and spend time rubbing it in. The texture is thicker than I expected and a bit glue-like and the scent, well, not something I would choose. However, on the plus side, it has remarkable stickability and we found that it persisted after long swims in the pool and an hour in the sun. My husband, who typically turns red before tanning deeply, managed to avoid the lobster stage, and I loved the skin softening action of the “inactive” ingredients: aloe vera juice, safflower seed oil, castor oil, coconut oil, shea butter, argan oil, jojoba seed oil, Vitamin E, green tea extract and cucumber) extract. So top marks for the natural ingredients, excellent sun-blocking performance and water resistance, but I still dislike the slightly ghostly tinge. 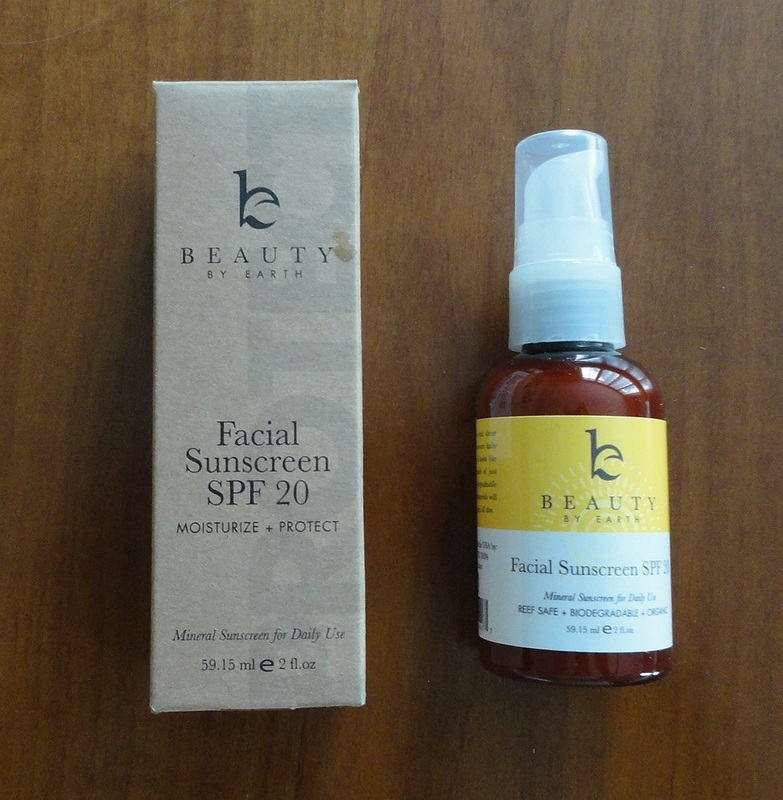 Like the rest of Beauty by Earth products, there are no noxious chemicals to worry about, and I am pleased to see that this sunscreen is not only safe for children, but also for marine life and the environment in general. If you are looking for a superior sun block cream with no harmful ingredients, you might want to give this a try. 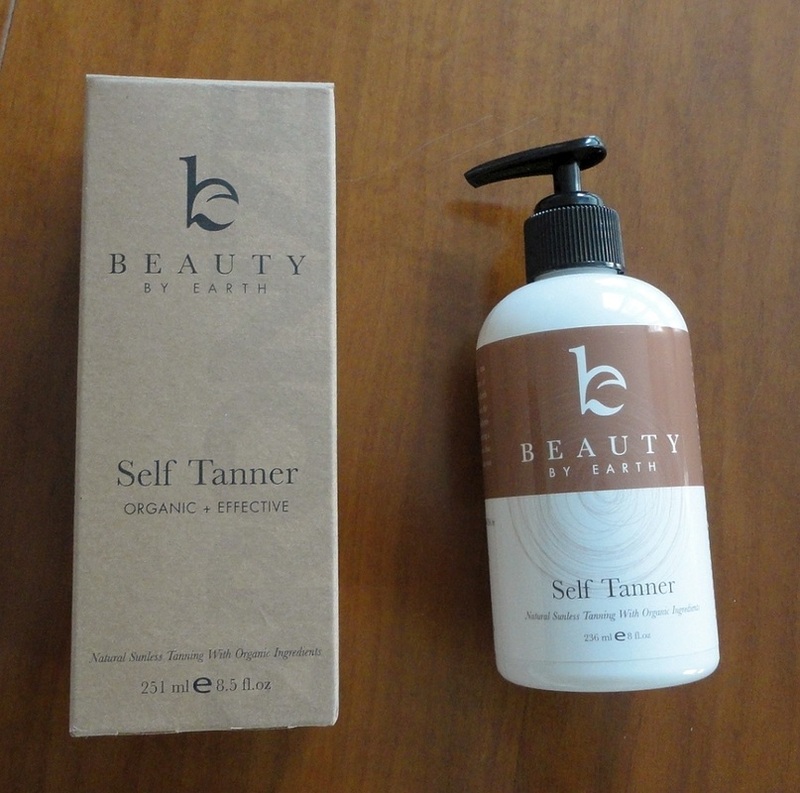 I love this self-tanning lotion and had great results using it but it did bring out again those horrible blotches on my face that I thought had been almost banished. I was also reminded of the vital importance of prepping your skin before applying self-tanning products such as this one. For my first application, I followed the instructions to the letter and thoroughly exfoliated my whole body in the shower with the black Konjac sponge from the same brand and a loofah on tougher spots such as knees and elbows. I applied the self-tanning lotion on dry skin and waited till next day to take a photo. 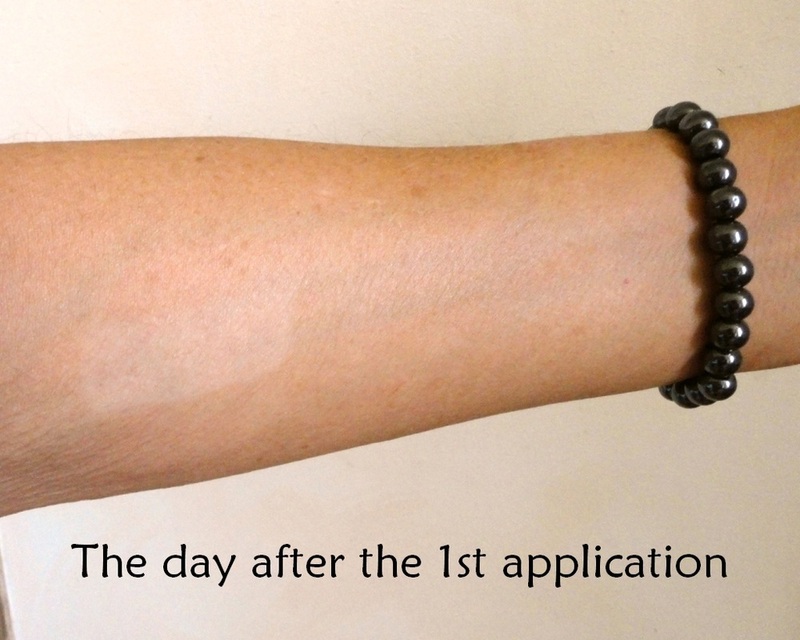 I had applied a piece of sticky tape to my arm, and you can see a slight difference in skin tone after just one day. Two days later, I repeated the application of self-tanner but without exfoliating beforehand. Obviously a mistake, because the second application turned out less even, especially over my calfs. I took a second photo of my arm and I can see a degree of difference again between the treated skin versus the skin protected by the tape (sorry I could not reproduce the exact light conditions!). At this point, the instructions say to continue using the self-tanner every few days or weekly, as needed to maintain a golden appearance. I'm using it every 5-6 days at the moment and may taper down even more as my legs seem to stay reasonably tanned for the moment. I found the lotion a pleasure to use: just a little was enough to cover my whole body and it easily washed off the palms of my hands. There is a little residue, so take care to wash before wearing light-coloured clothing. I loved the results, however, I would remind people with discolouration issues like mine to use with caution in the areas where their skin is prone to blotchiness, because the age spots on my face, that had faded away with skin brightening products, were reactivated again by the melanin stimulation. 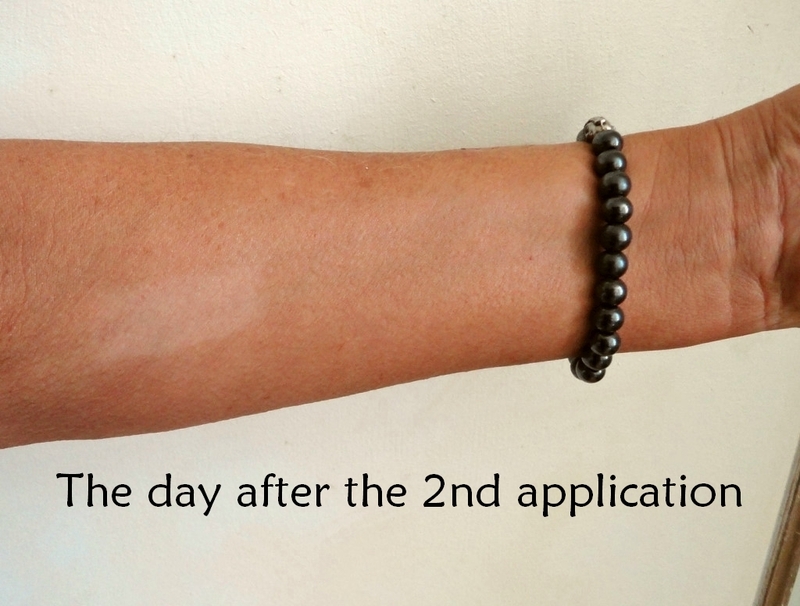 This is not the fault of this product specifically, but rather a common result of using sunless tanners. Luckily, I found that natural sun exposure, with the appropriate sunscreen, produces a much more even result, so I will keep this lotion for use on my body. For my face I will use make-up and natural tanning with sunscreen. This brand offers two such products, a very effective SPF20 mineral-based sunblock (especially good for children and very fair complexions) and an everyday, lighter sunscreen for the face. I have no hesitation in awarding this lotion a full five stars for its tan producing qualities, the beautiful natural shade and ease of use. I'm also very happy about its all-natural ingredients because I have given up skin care that contains parabens and other toxic ingredients, and here is a perfect alternative. I don't normally use lip balms, preferring clear lip glosses. But these delicious beeswax sticks, which I bought at a discount, have just changed my mind. The all-natural, almost edible, ingredients are exactly what I look for in skin care and make-up. They are all reassuringly recognisable: Beeswax, Coconut, Castor and Sunflower Seed Oils, Aloe Vera, Vitamin E, Rosemary extract, Stevia extract (best known as a sweetener, extracted from the leaves of a plant in the daisy family), Lanolin, Shea Butter, Cocoa Seed Butter, and natural Brown Sugar and Vanilla flavours. I also appreciate the cruelty-free stance. I have started to use these lip balms as primers, to place a protective barrier between my lips and whatever dubious ingredient may lurk in cosmetic lip glosses. I don't know if it's enough, but it makes me feel like I'm at least trying. Or, when a high gloss is not required, I simply add a touch of lip liner pencil to the lip balm on my lips to provide all the pigment I need. My husband, a big lip balm user, tells me that this formulation is the smoothest and most melting of all the brands he has tried (quite a few over the years). He has switched to these new flavours without any prompting from me. Packaging is gorgeous, as usual with Beauty by Earth, and the line drawings on the parchment-like cardboard remind me of illustrations in medieval herbal books. 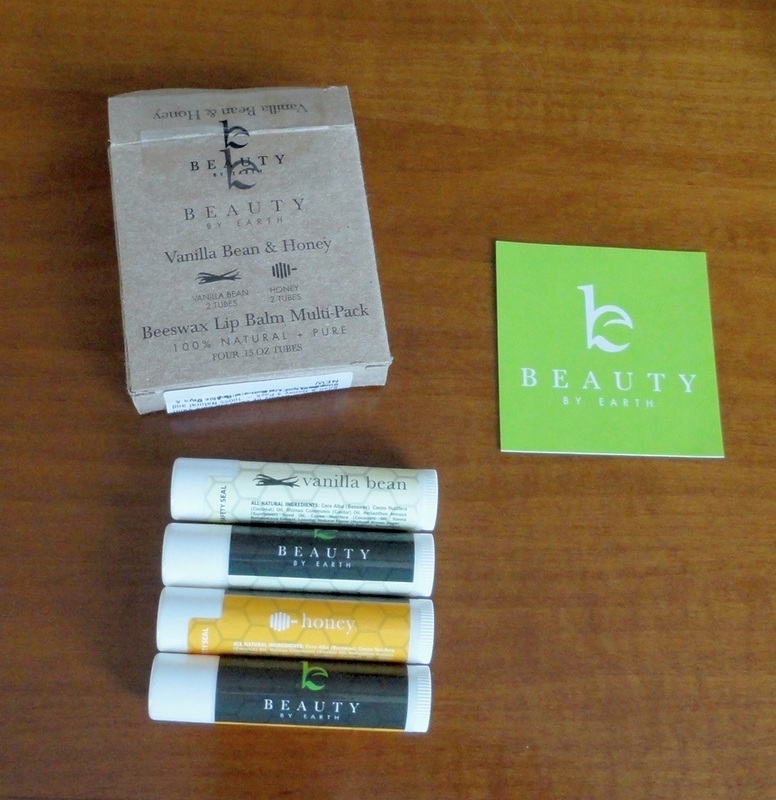 As lip balms go, these are superb and certainly the best tasting I've tried. 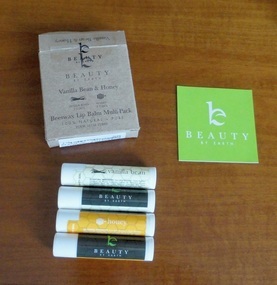 This yummy lip balm comes in other flavours, too. 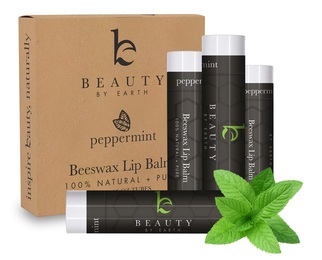 If you like Peppermint (I adore it), you can buy the box of four sticks. 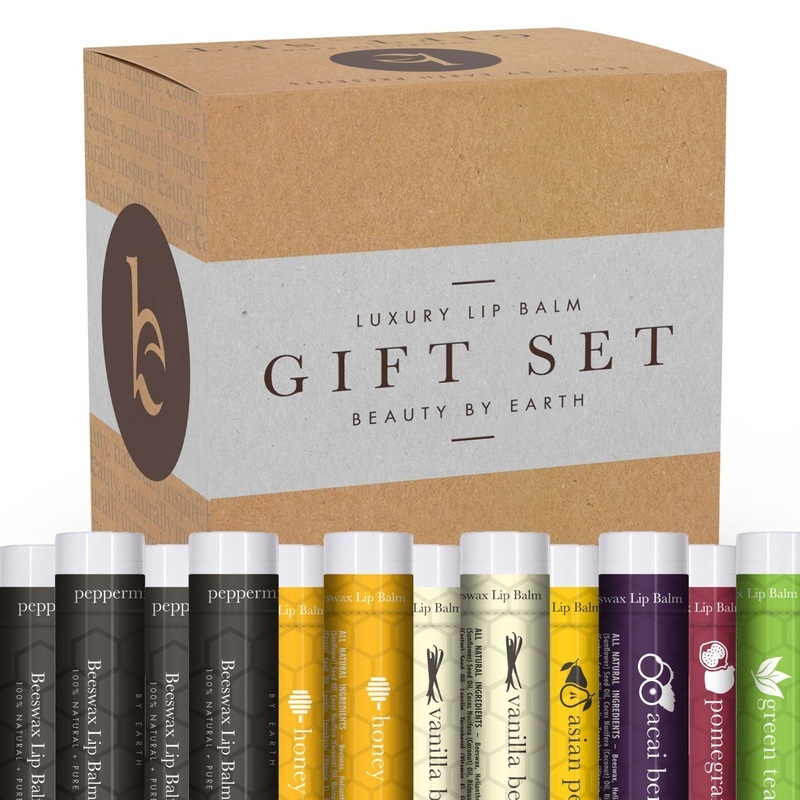 If you are feeling generous, there is a box of twelve tubes packaged as a Gift Set. This amazing assortment of all-natural flavours includes: Green Tea, Asian Pear, Acai Berry, Pomegranate, Honey, Vanilla Bean and Peppermint. A perfect gift for the outdoor enthusiast.